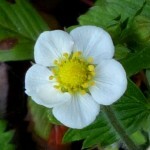 Home Dicots Strawberries in the lawn?! Summer is marked out by strawberry season. 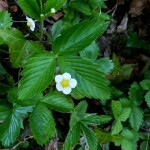 Botanically there are several summer strawberries to consider! Here’s three options for starters (though only one of them suitable for desert!). 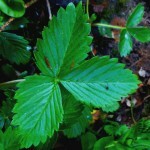 Wild Strawberry: Plant with long far-creeping runners, trifoliate leaves bright glossy green, with terminal tooth of leaflets longer than the adjacent ones. 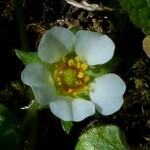 Flowers with 5 white petals longer than sepals which are not visible between the petals. 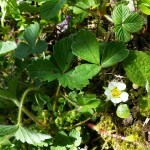 Ripe fruits are fleshy and red, miniature strawberries indeed! 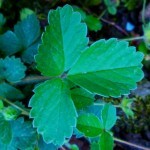 Barren Strawberry: Plant with short runners, trifoliate leaves dull bluish green with terminal tooth of leaflets shorter than the adjacent ones. 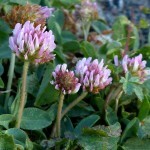 Flowers with 5 white petals each scarcely longer than sepals which are clearly visible between each petal. Ripe fruits neither not fleshy nor red (hence the common name Barren Strawberry). 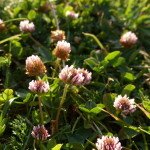 Strawberry Clover (Trifolium fragiferum): this clover can be mistaken for Creeping White Clover (Trifolium repens) but it a much more attractive plant and with a strawberry connection! 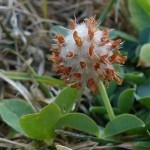 Strawberry clover is a creeping plant like T. repens but the flowers are always pink and the calyx tube is hairy (glabrous in T.repens) and swells in fruit to form the pinkish, netted and downy bladders which give the Strawberry-like appearance alluded to in the common name – fragiferum. When in flower or fruit T.fragiferum and T.repens are easy to tell apart. When not in flower or fruit a key difference is that T.fragiferum has thickened side veins in the leaflet which are branched and curve back at the tips. 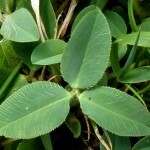 By contrast T.repens has around 7 unbranched side veins per side.